At some point in our lives, all Canadians are likely to be affected by a mental illness, whether it's through a family member, a friend, a colleague, or through personal experience. And many people face these mental health issues during their working years. Promoting mental well-being at work makes good business sense. 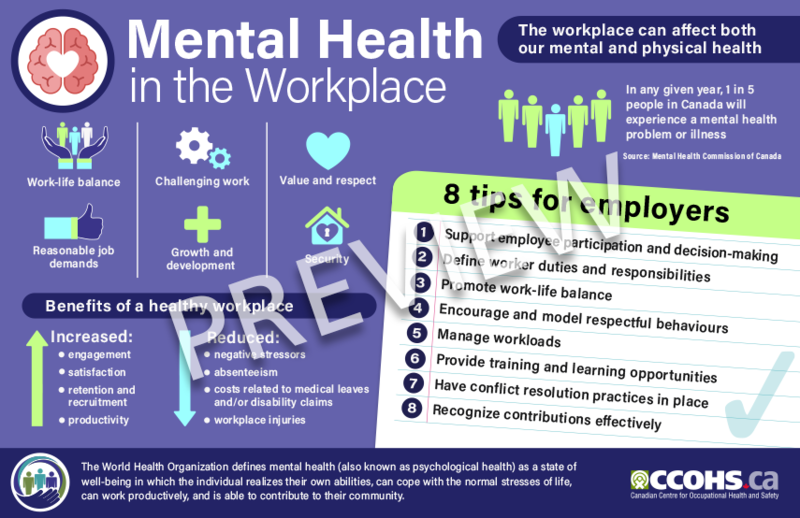 Get the big picture about the state of workplace mental health in Canada, including tips for both employers and workers on how to improve psychological health and safety at the job, in this infographic. Infographics are designed to be read online, so we encourage you to share them to your online social networks and e-mail. When printing our infographics, please note that they are optimized for 11 by 17 inch paper. We also develop larger posters ideal for printing and display, based on the guidance offered in our infographics.